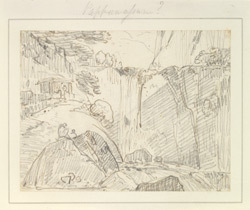 During his travels in India, Thomas was accompanied by his young nephew William who sketched with him and also kept a journal of their journey. Here we read, "The Fall of Pappanassum is on the river Tumrabunni, a considerable stream in the district of Tinnyvelly...This magnificent cataract is held by the Hindoos in great veneration, and is accordingly visited by innumerable devotees. The only approach to it is by a single path on the right hand side of the valley, whence, though near to the fall, it cannot be seen, owing to the interposition of a large mass of rock that projects into the water. The path is continued up the face of this rock by means of a flight of steps; and at the summit a gate is so placed, that all visitors must of necessity pass through it...Nothing can be more grand and impressive than when, on first throwing open the gate, this extraordinary scene bursts upon the sight. It would be difficult for those who have never seen a vast river precipitated down a rocky steep of considerable elevation, to form an adequate idea of such a spectacle, accompanied by a noise so tremendous, that, comparatively, all other sounds are but whispers..."